Ydanis Rodriguez and DOT announce six temporary pedestrian zones across the city. On Saturday, April 22, the city will open up 30 blocks of Broadway for people, creating a string of car-free areas from Union Square to Times Square. City Council transportation chair Ydanis Rodriguez and DOT announced the event this morning, and Transportation Alternatives organizer Chelsea Yamada posted a dispatch on Twitter. It’s the second year in a row that the city will be putting on “Car Free Day” events in observance of Earth Day, and the scale will be larger. Last year, there were four car-free zones, all in Manhattan, in effect for four hours each. With Earth Day falling on a Saturday this year, the city is going bigger. In addition to Broadway, parts of St. Nicholas Avenue in Upper Manhattan, Montague Street in Brooklyn, Shore Boulevard and Woodside Avenue in Queens, and Eagle Avenue in the Bronx will be car-free from 10 a.m. to 4 p.m.
It’s not clear yet how many cross-streets will also be car-free on those routes, but last year DOT pedestrianized smaller side streets along Broadway. This isn’t an April Fool, is it? I’m glad the event is expanding–maybe we’ll get to have a real car-free day eventually. This should run at least one weekday/working day. If people see there’s no traffic impact to losing Broadway even during “peak” then it stands a chance of permanence. …and NYPD will be out in full force, ticketing bikers for running “red” lights in that stretch. Would you be able to ride back and forth on this on a bike like with Park Avenue and Lafayette during Summer Streets? At those intersections where cross-streets are open to cars, the red lights will be in force, and rightfully so. In Summer Streets, many intersections are closed off; and the lights at these intersections are not binding. Perhaps this approach will be taken on Broadway. Anyway, we can expect the event to be hideously overstaffed by the police, who see an opportunity to get overtime for doing nothing. Let us note that no one calls for a blanket police presence on ordinary days when streets are infested with cars. But, when a street is open to bikes and pedestrians, this somehow warrants crisis-level staffing. Just another of the many indications of how far wrong our society has gone. I’m not disputing you on the potential non-binding red lights. But I do wonder… Central Park goes car-free every day, and yet the NYPD has made it abundantly clear that red lights apply always and forever. illuminating is the Easter Parade on Fifth which somehow warrants little excess security required. Hmmm could it be they beat officers refuse O/T on Easter ? Totally agree. I love car-free day, but there seems to be a tad too much emphasis on recreation and not enough on transportation. That’s true. So I suppose that there’s no way to know what their approach will be until the day arrives. Here’s a better idea—make all of Manhattan car-free 365 days per year. They’ve been talking about doing this from before the time I was born. It’s high time we actually did it. In the parts of Central Park which are now permanently car-free 24/7 advocates need to press the city to remove the traffic signals. I always thought part of the impetus for getting those sections car-free was to do exactly that. I was dumbfounded when the city said the lights are staying. Nowhere else in the world uses or needs traffic signals when there are just bikes and pedestrians. At the few more crowded crossings maybe we should take a cue from the park’s designer and put in bridges. If we were sane and made the event run a lot longer, like 7AM through midnight, or better yet all weekend, then there might not be so many bikes as to make it difficult to cross. We’re trying to cram everything into only a few hours solely because we’re afraid of inconveniencing drivers. Enough of that already. The streets belong to everyone. 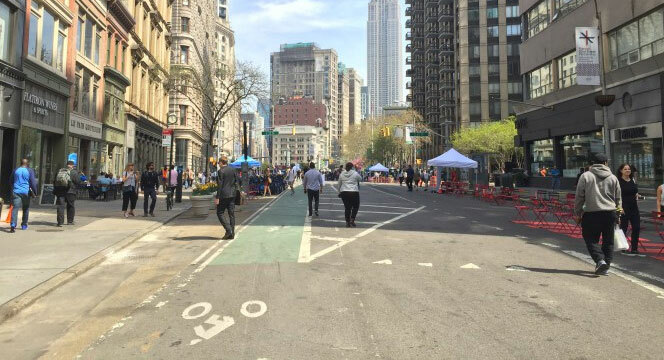 I’m all for making ALL of Manhattan car-free for at least a few weekends per year. Do the same in parts of the outer boroughs. Maybe when people see the world won’t end if we don’t have car access everywhere it might be feasible to start closing some streets to car traffic permanently. Broadway should be such a street. Eventually much of the city could be closed to motor traffic. It’s always the 22nd – so last year it was a workday, and it will be again. Good to have a sample for every day of the week to show that the world will not self-destruct. Imagine the chaos and the damage to business if this were done on a Monday to Friday business day. I wonder if the millennials know how bad for the planet a lot of the high tech and eco-friendly stuff they use is? I doubt it. Again, lack of knowledge and misplaced priorities.